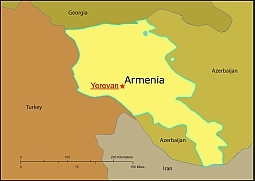 Editable royalty-free map of Armenia in vector-graphic online store. 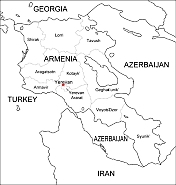 Armenia is located in the mountainous Transcaucasia region, southwest of Russia between the Black Sea and the Caspian Sea. A small, landlocked country, Armenia’s terrain is largely that of plateaus and rugged mountainranges, with the exception of a few fertile river valleys and the area around Lake Sevan. Half of the country is above 6,090 ft (2,000 m) in elevation. The Aras River and the Debed River valleys in the far north are the lowest points, with elevations of 1,158 ft (380 m) and 1,310 ft (430 m) respectively. The Armenian Plateau was formed in a geological upheaval of earth’s crust twenty-five million years ago.The northern mountain chain began forming in the Jurassic period; the western chain dates from the Tertiaryperiod. Geological instability still causes major earthquakes in Armenia. Gyumri, the second largest city in the republic, was devastated by a massive quake that killed more than 25,000 people in December 1988. The Armenian climate ranges between subtropical and sub-temperate. The rich soils of the arable river valleys contain vineyards and orchards; the flat tablelands are primarily pastoral. Although Armenia lies not far from several seas, its high mountains block their effects and give it a continental highland climate. It has cold, dry winters and hotdusty summers. Temperature and precipitation depend greatly on elevation, with colder and wetter seasons in the high north and northeast. The widest variation in temperature between winter and summer occurs in the central Armenian Plateau, where in midwinter the mean temperature is 32° F (0°C); in midsummer the mean temperature is over 77° F (25°C). Overall, Armenia is a sunny country. Precipitation rates depend on altitude and location, but are heaviest during autumn. In the lower Aras River valley, the average annual precipitation is 10 in (250 mm).It can reach 32 in (800 mm) in the mountains.Forests and Jungles Armenia’s natural forest land was largely cleared in the early 1990s for use as firewood.